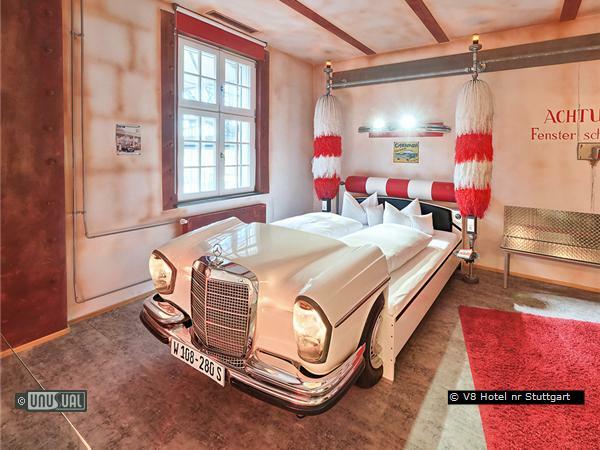 Part of the Motorworld classic car restoration complex on the old Zeppelin airfield near Böblingen, 10 of the 34 rooms have had extreme makeovers to allow you to sleep in a Mercedes, Morris Minor, Cadillac or Volkswagen. Petrol Head Heaven - with Dreams to match ! 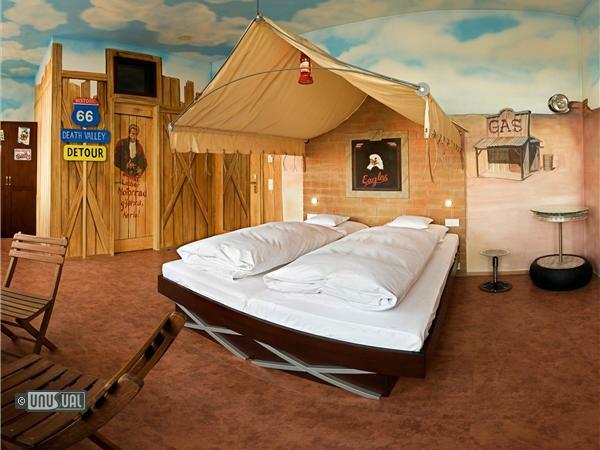 There are 10 styled theme rooms, singles, doubles, plus a family room and the spacious Tower Suite, with a fantastic panoramic view. 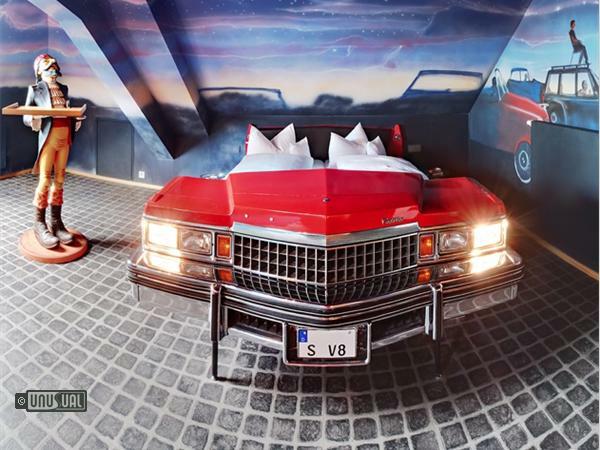 The 24 standard rooms have some great wall photography but the theme rooms really take the automotive element to a new level. Perhaps you wish for the luxury of sleeping in a converted white Mercedes bed – bright and polished from the carwash? 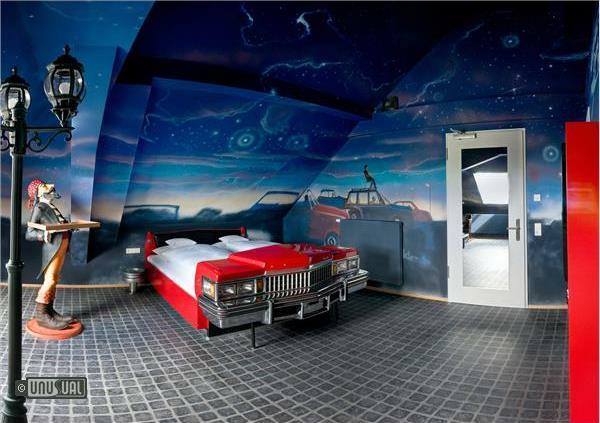 Maybe airbrushed custom paintwork and chrome is more your style in the Tuning bedroom? 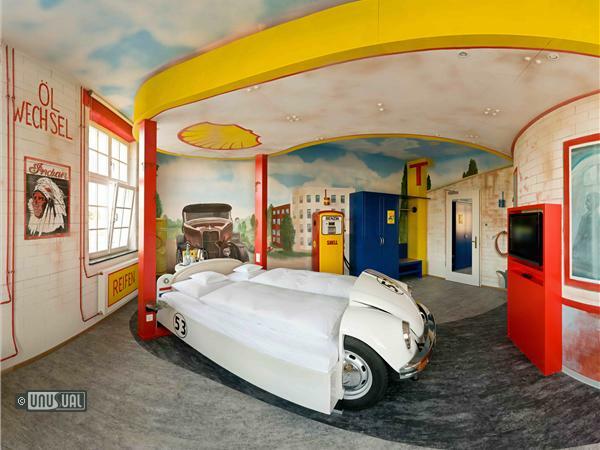 Or the 53 Beetle Herbie parked up as a bed in the Petrol Station room? 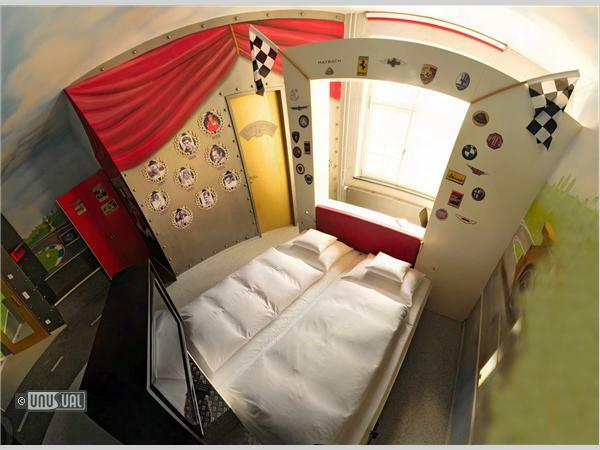 A Cadillac bed and artwork themed around the drive-in cinemas of the 50’s and 60’s, or a room themed for the outdoors, in V8 Camp? 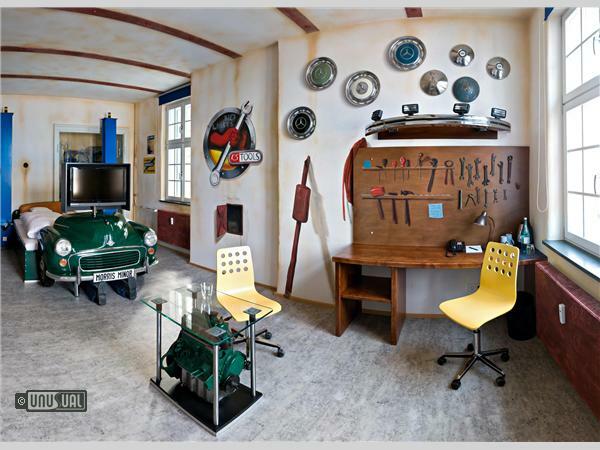 While everyone will have a favourite, the Morris Minor car bed in the ‘Workshop’ room – complete with mechanic under the car, deserves special mention. Your bed is hoisted on lifting jacks, and your bedside table a drum of oil. A mechanics workbench your writing desk. 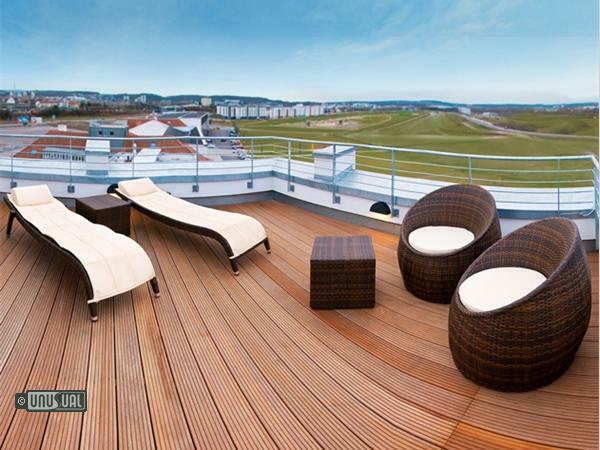 Also the Tower Suite – with bathroom including a private sauna, bedrooms and lounge split across 4 floors of the old Control Tower, including a roof terrace at the top. 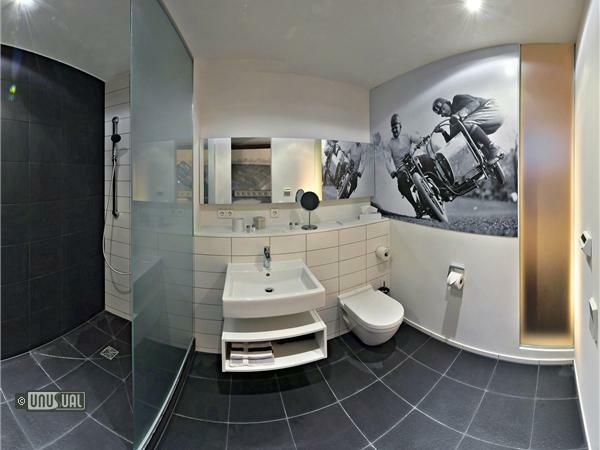 While all rooms echo the clean crisp lines of this period of architecture, the interior detail is certain to raise a smile among petrol-heads and car-aficionados everywhere. 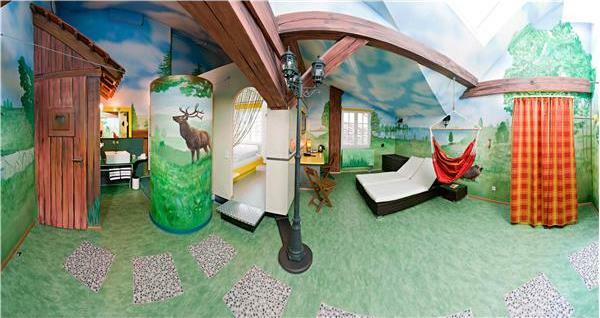 Rates are from €150 for the double rooms, €170 for the theme rooms and the Zeppelin suite €450. 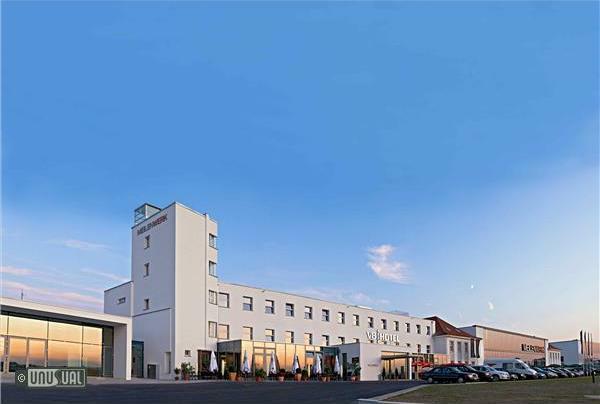 The hotel is a 5 minute walk from Böblingen S-Bahn rail station on line S1, which connects to the S2 and S3 lines if you’re visiting one of the many trade shows in Sindlefingen or arriving at Stuttgart airport. For cars, from the A81, take exit 23 Böblingen / Sindelfingen and drive at the 1st Traffic light turn right in direction of Böblingen. Now, turn right onto Graf-Zeppelin-Platz. 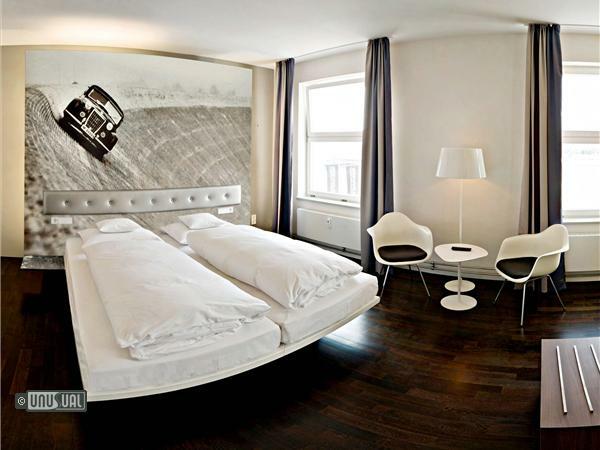 Hotel V8 Motorworld Region Stuttgart is located on your left. 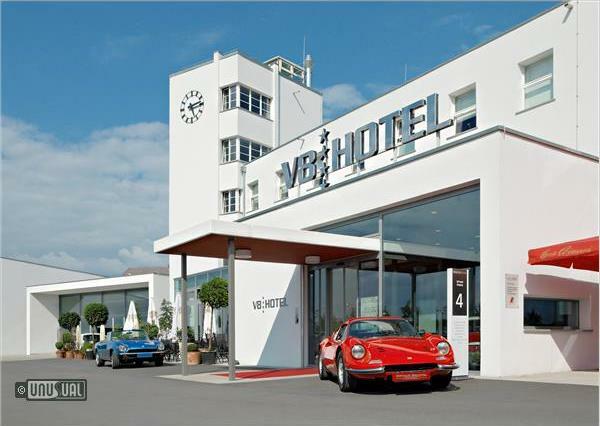 The hotel organises a number of car themed events and show throughout the year, using the next door "Legend Hall". 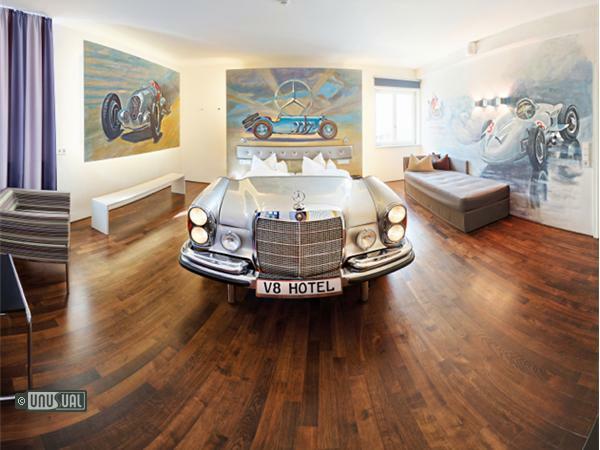 Stuttgart is also the home to the Porsche and Mercedes Museums, with their tours. 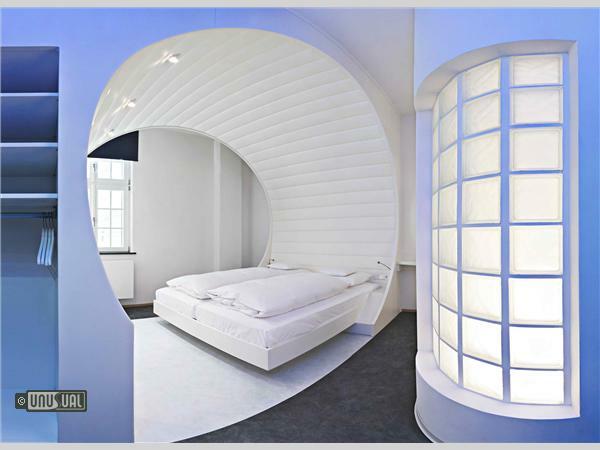 To make your stay more comfortable, V8 recommend you to make restaurant reservations in advance. If you prefer the local Swabian cuisine, you´ll dine in style at Schloss Solitude with Chef Jörg Mink. 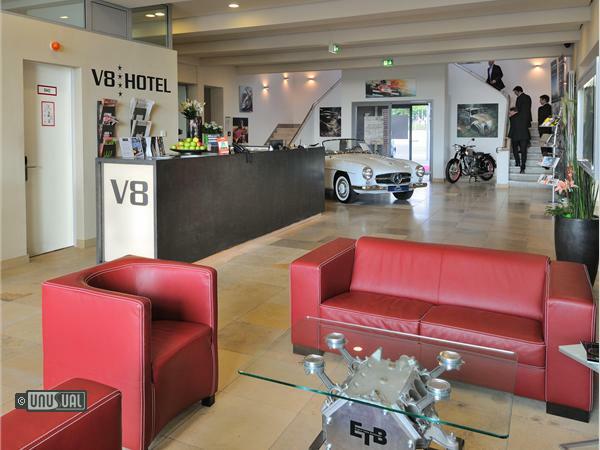 The restaurant is only 10 to 15 minutes away by car from the V8 HOTEL. Reserve your table using the keyword “V8 HOTEL” and receive a free welcome cocktail. 0711-469 07 70. The UK is in the middle of a Gin renaissance, with hundreds of micro distilleries showcasing their botanical flavourings of the juniper infused spirit, Genever. Originally from what were once termed the low countries of the Netherlands and Belgian Flanders, this Genever became popular with English soldiers fighting the thirty years wars of 1618-1648.